openSAP Reactivation Codes Now on General Release! At SAP TechEd Las Vegas and Bangalore, we launched our new openSAP, Course Reactivation Option and provided free reactivation codes to attendees; and we had a great response! The reactivation option allows openSAP learners to reactivate weekly assignments and provides an opportunity to earn a Record of Achievement (available for selected courses only). From today, you can now purchase a reactivation code at SAP Store at the cost of €39. 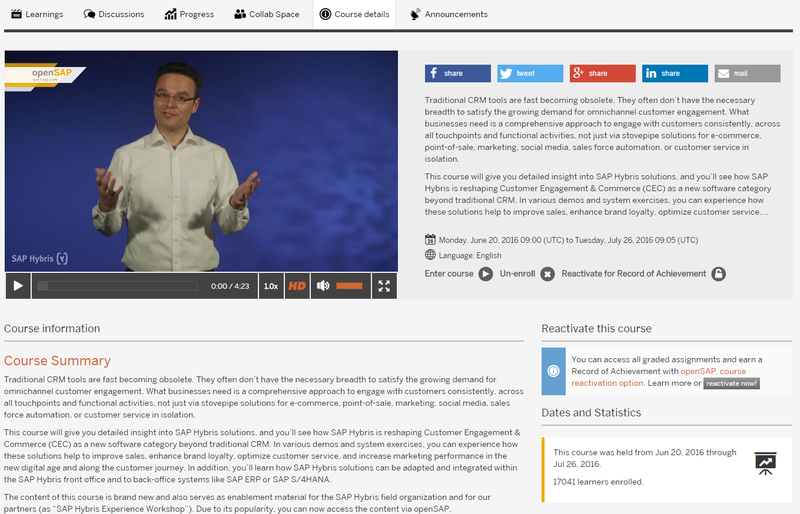 How does openSAP course reactivation work? If you’re interested in earning a Record of Achievement in self-paced mode, check the course to see if there is an option to Reactivate for Record of Achievement. If it’s available, you can purchase one openSAP reactivation code at SAP Store for €39, with bulk discounts available. Simply enter the reactivation code in the Redeem code box on the course page where you wish to earn a Record of Achievement. You will then have 8 weeks to complete the assignments and final exam. Important: Remember to check if the course you’re interested in is available for reactivation before you purchase the reactivation code. What if I complete the weekly assignments and final exam during the scheduled runtime; can I still earn a Record of Achievement without any charges? If I don’t want to earn a Record of Achievement, can I still access the learning content in self-paced mode free of charge? The goal of MOOCs at openSAP is to encourage learners to complete the content within a specified timeframe and to benefit from features such as the discussion forum. We want learners to join the scheduled courses and share experiences with others, collaborate, and ask questions as this is the key benefit for learners taking part in MOOCs.If learners can earn a Record of Achievement free of charge at any time, the motivation to deliver courses in MOOC format would be lost; learners would enroll but very few would complete the content and put the knowledge to work. Our aim is to support learners who could not complete the course during the scheduled run time to earn a Record of Achievement, without affecting the experience of a live course. openSAP reactivation codes are now available to purchase on SAP Store so if you’ve always wanted a Record of Achievement for a past course, go ahead and try it out! Which courses are eligible for this product? The FAQ leads me to believe the list of ones that aren’t might be smaller. Can you post them in your guide, or on the course pages? I can’t find the requirements you’re referring to. Under the third and fourth course, you will see that there are only two options – they are missing the “Reactivate for Record of Achievement” option. Therefore, they are not available for reactivation at the moment. Another way to see if the course is eligible for reactivation is on the course details page. In this example, for Experience SAP Hybris Solutions you can clearly see a “Reactivate this course” section. Some courses are not available for reactivation right now but they might be in the future. Or they might be available for reactivation but it might be disabled in the future. I hope this helps you to find courses that are available for reactivation and explain the use case also. Thank you so much for the prompt and clear answer with a SCREENSHOT for an example.